Golu and sundal are synonymous in my opinion. I love golu hopping and sundal collecting. All festivals, especially Navratri golu brings back those nostalgic childhood memories. 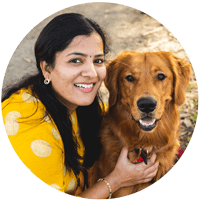 I used to wear pattu pavaadai /silk lehenga and invite our neighbors to visit our golu and come back home with loads and loads of sundal. Sundal is a healthy legume stir-fry prepared during the festivals which we offer as neivediyam. Sundals are perfect evening snacks as well. They curb the mid-afternoon hunger pangs. 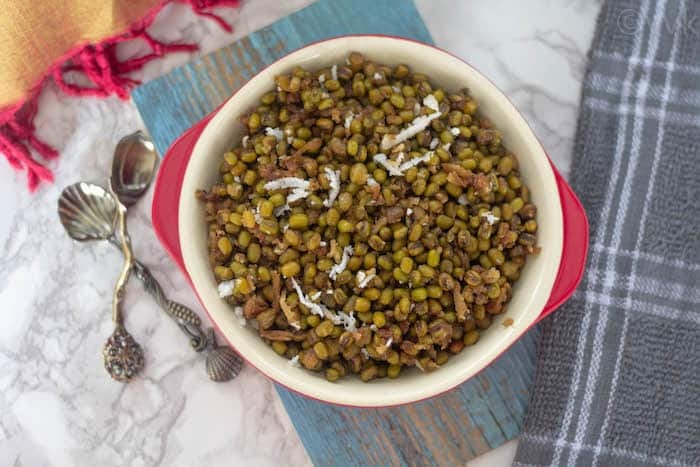 You can prepare sundal with any legumes and lentils like channa dal, kidney beans/rajma, black-eyed peas, peas, garbanzo beans, horsegram, etc. Sundal preparation is simple. Cook the legumes and temper it with simple spices and coconut. That’s it. It is the basic version. But you make your sundal podi or spice it up with sambar podi or fresh ground coconut masala. 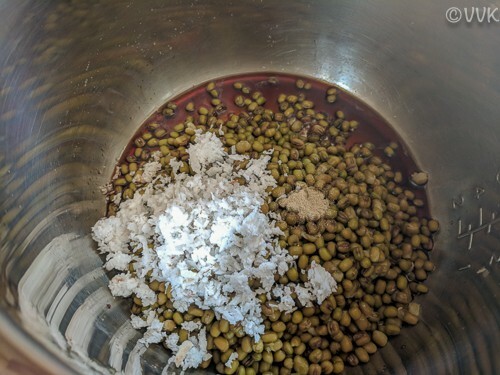 And if you are making sundal during the non-festival time, you can include onion and make these garbanzo beans stir-fry kind as well. 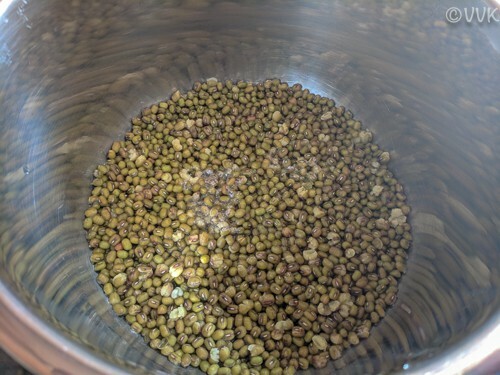 Today, I am going to share a sweet sundal version that I made with the green gram or green mung bean or as we say in Tamil patchai payaru or paasi payaru. I used jaggery to sweeten this up and guess what, no tempering and that means no oil. 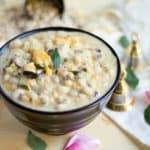 This sweet sundal is a zero oil recipe with the goodness of green gram, jaggery, and coconut flavored with cardamom powder. 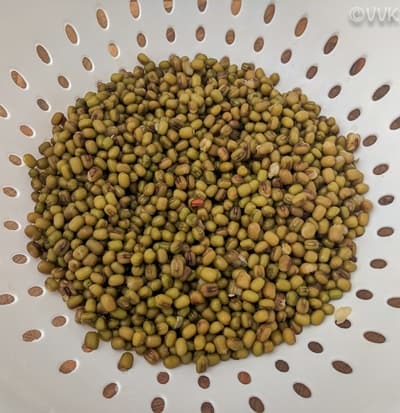 How to cook green gram dal for sundal? 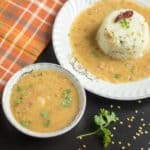 For sambar/muga mole randayi or masiyal, we need mushy dal, and it is quite easy to cook. But for sundal, I don’t prefer a mushy dal. 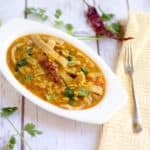 I always go for soft and grainy yet cooked dal; precisely the al-dente form is what I prefer. 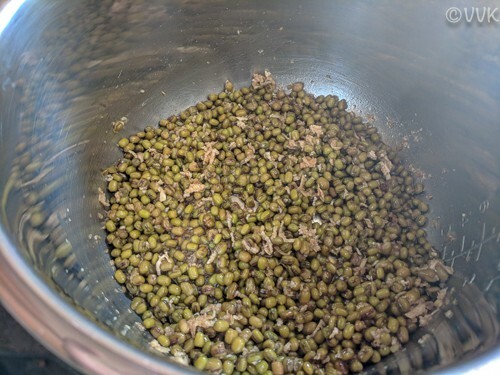 Mung bean cooks pretty fast and even cooking for one whistle in the pressure cooker makes it mushy, and that’s when I started following the open-pot method and instant pot. 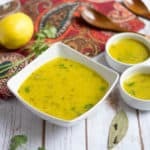 Make sure you soak the dal for at least six hours. Drain the water and cook in a pot or pan. 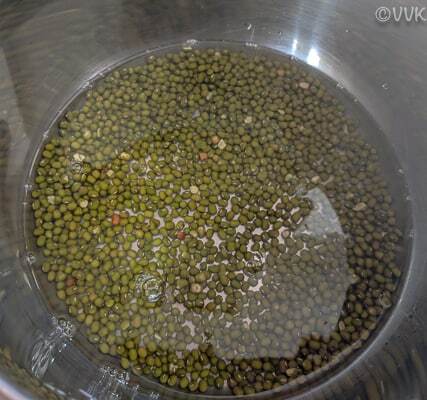 If you soak 1/2 cup dal, then take twice the measure of water, add it and allow it to cook over medium heat. After 10 minutes, check if the dal is ready. 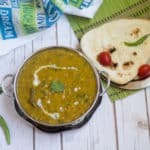 If you can mash the dal with ease, then turn off the heat. It usually takes about 10 to 15 minutes depending upon the quality of the dal. But not more than that. For the IP method, I just soaked it for 30 minutes. So I pressure cooked it in manual mode for 3 minutes and release the pressure naturally. Alternatively, you can cook it for 4 minutes and quickly release the pressure after 5 minutes. 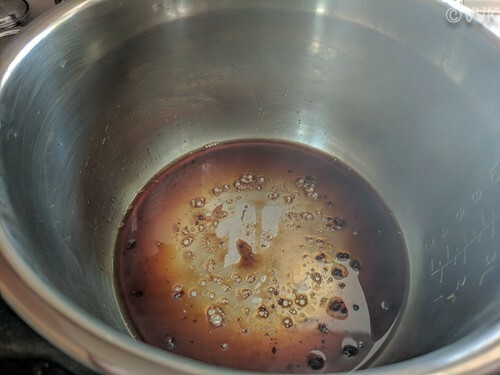 If you have soaked the dal for at least 6 hours, then pressure cook for just one minute and do a quick pressure release after 4 or 5 minutes. Soak the dal for minutes and drain the water. Add the dal to the inner pot and add 1 cup of water. Set the IP in manual mode and pressure cook for three minutes and release the pressure naturally. Carefully open the lid and reserve 2 tbsp of cooking water and drain the remaining water. Set the IP in saute mode and add the 2 tbsps of water and 1/4 cup of powdered jaggery. 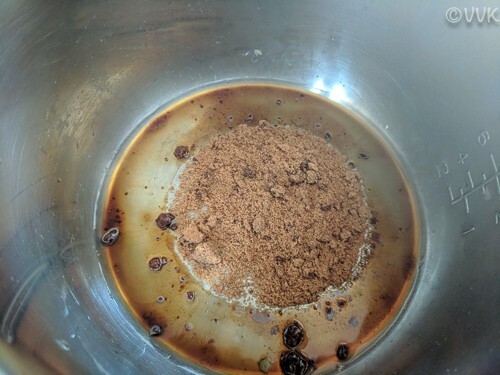 Allow the jaggery to melt and dissolve. And then add the cooked green gram dal, coconut, and cardamom powder. Mix well and cook until all the water is absorbed. That’s it. 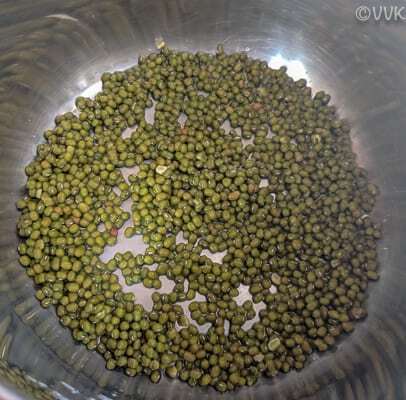 Sweet green gram dal sundal is ready. 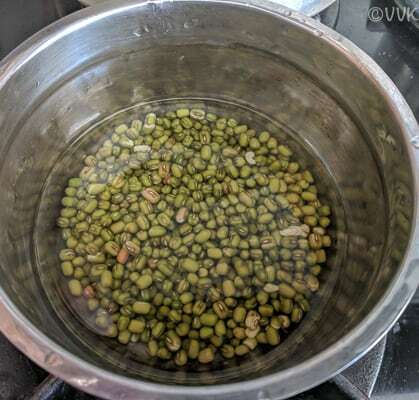 Soak the mung bean for at least 6 hours and then drain the water. 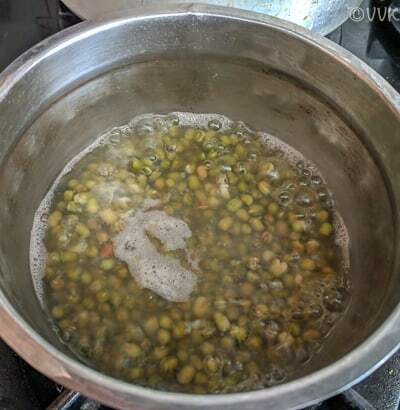 Cook the green gram dal as mentioned above in the open pot method by adding 1 cup of water. When the dal is aldente, turn off the heat and, reserve 2 tbsp of the cooking water and drain the remaining. Heat the kadai and add 2 tbsps of water and 1/4 cup of jaggery. 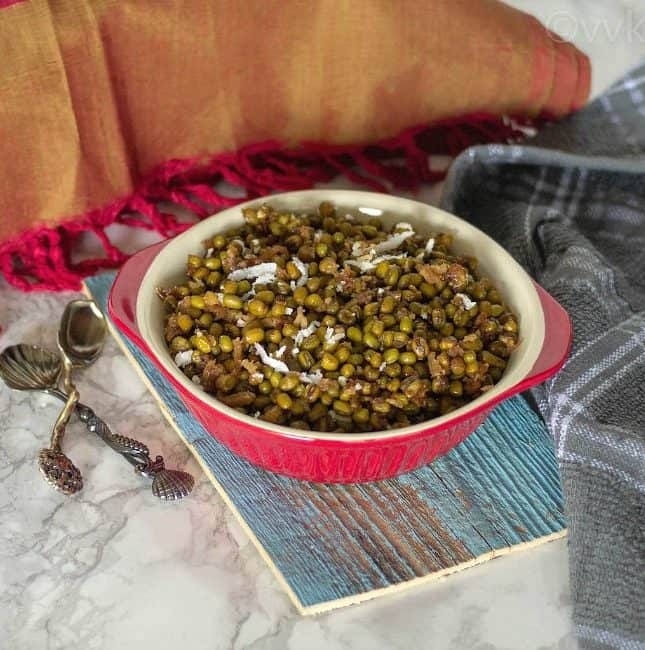 Allow the jaggery to melt and dissolve and then add the cooked green gram dal, coconut, and cardamom powder. 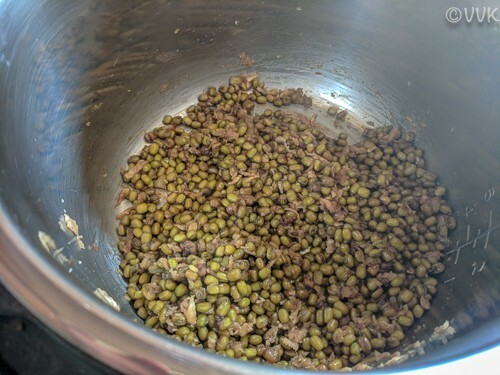 Please check the details above for getting the grainy moong beans. The cooking time depends upon the quality of the dal as well. Adjust the jaggery and coconut according to your preference. You use the whole cardamom too. But crush it and add it to the sundal. 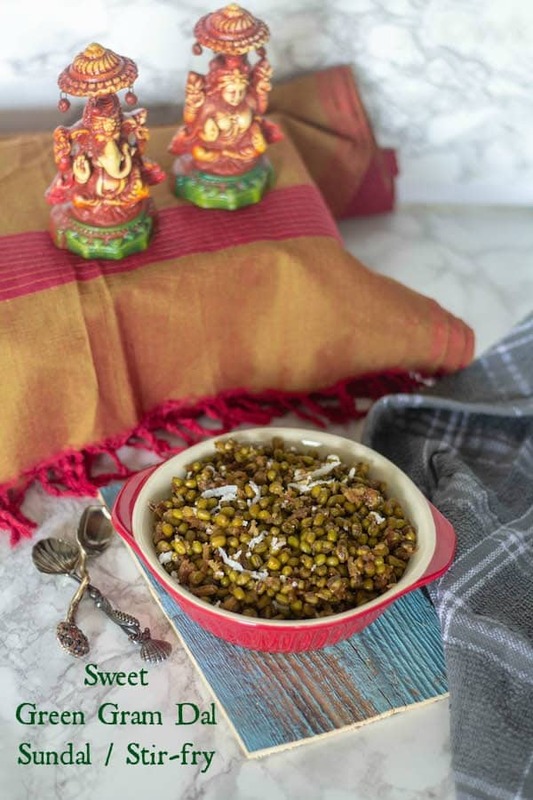 A nutritious sweet stir-fry made with green mung beans and jaggery without any oil. A perfect sweet neivediyam/offering for any festive occasion. Soak the dal for minutes and drain the water. Add the dal to the inner pot and add 1 cup of water. That's it. 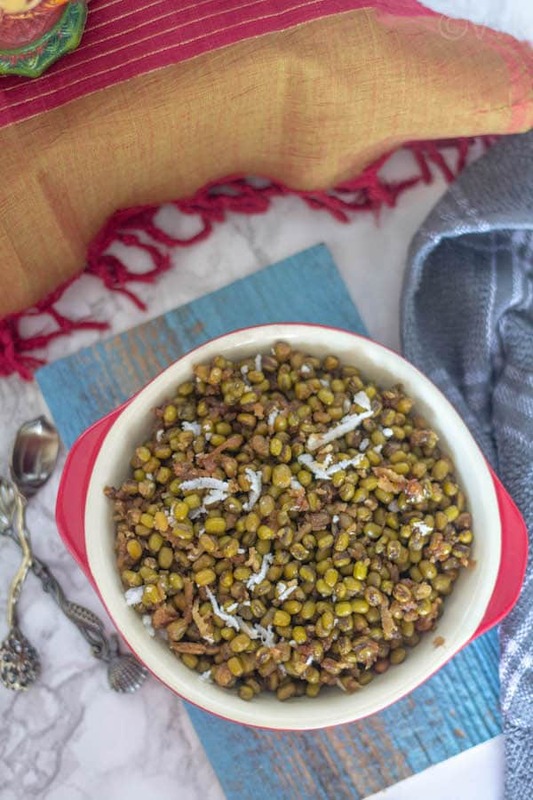 Sweet green gram dal sundal is ready. Sri Iniku nan green gram vella Sundal tan pannen:-) Amma use to do putty but I haven’t tried so sweet irukatama ithu pannen. superb gollu ma.. Thanks :-) yeah no oil.